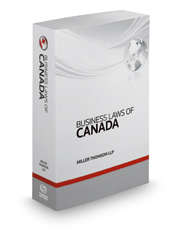 Home > Law Books > Treatises > Business Laws of Canada, 2019 ed. Business Laws of Canada, 2019 ed. This one-stop research source provides explanations of key issues and pitfalls and offers practice-oriented examples and case studies that make application of legal theory easy for busy practitioners.